Starting GPS Co-ordinates: N51 06' 80" W000 80' 70"
Finishing GPS Co-ordinates: N51 08' 00" W000 76' 60"
To see: Hollycombe Steam Collection. Starting from Portsmouth Road (B2070) at Wheatsheaf Common (complete with its tumulus) our byway heads southwards down the drive of a cottage. When we visited (15/02/2013) there was resurfacing work being done by the golf course at this point, but was only scheduled to last a month or so. Very quickly the lane passes under a railway bridge that carries the Waterloo-Portsmouth main line and continues on a solid, wide earthen/grass lined surface around a corner towards junction presided over by an electricity pylon. Here, take the left-hand (southern) branch (the right simply leads onto the golf course) and travel down it for another 100m or so. 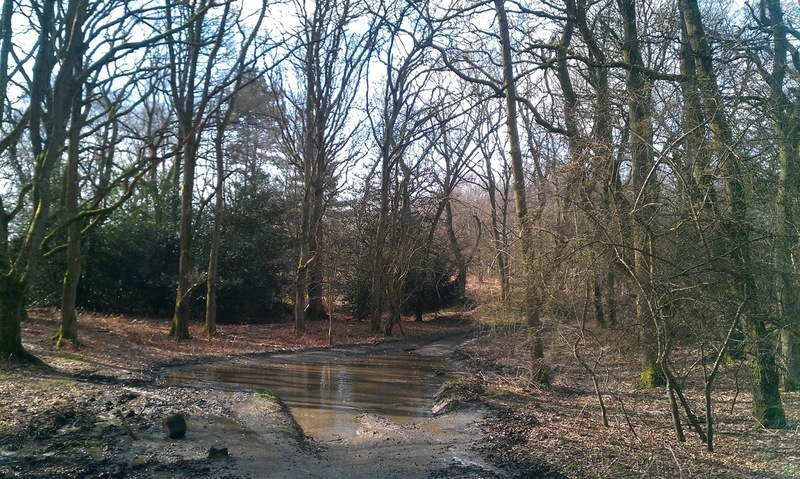 Presently the byway reaches precisely 102m above sea level, and marked by a sign the byway turns hard to the east (see picture, right) ahead is a footpath despite the tyre tracks: don't drive on it) and plunges into woodland. The undergrowth at this point is a non event even though it does close in later on, but what does present a challenge here is a pretty deep, well, pond I guess! It had been relatively dry for a couple of weeks beforehand but even so this was still a fair quagmire! It does have a solid bottom, however, and we got through without too much effort. 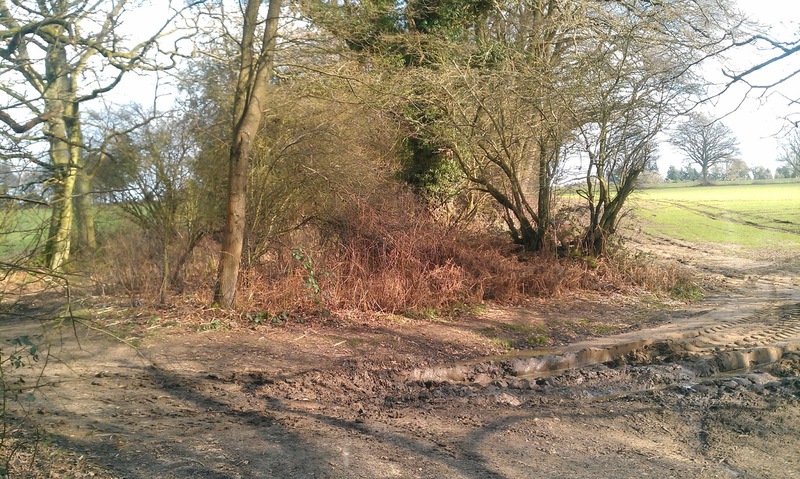 After the 'pond' the byway is somewhat disguised by a field entrance. Tractors clearly go out of one field and into another across the byway and it can get pretty churned up, but its obvious enough where the byway leads along an 's' turn, first left and then right. that narrow the lane sufficiently to create a decent narrow obstacle, especially since in places the holly is closing in. Take care, and expect the odd scratch on the paintwork! After climbing for a further 27m AMSL the gradient shallows out and the lane turns towards the north. Some bamboo from the back gardens that border the byway has gone absolutely mental here (it REALLY needs to be cleared, Mr. Homeowner) to the point where it stretches almost completely across the lane, but our Defender brushed past it with aplomb. 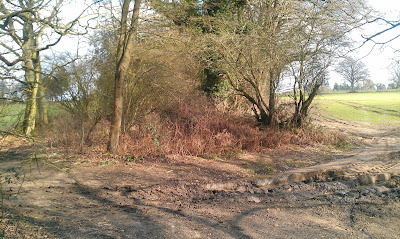 The green lane then ends on Midhurst Road, just south of Liphook. Not a bad lane at all! Nearby to the south can be found the Hollycombe Steam Collection, a great day out if you have kids. 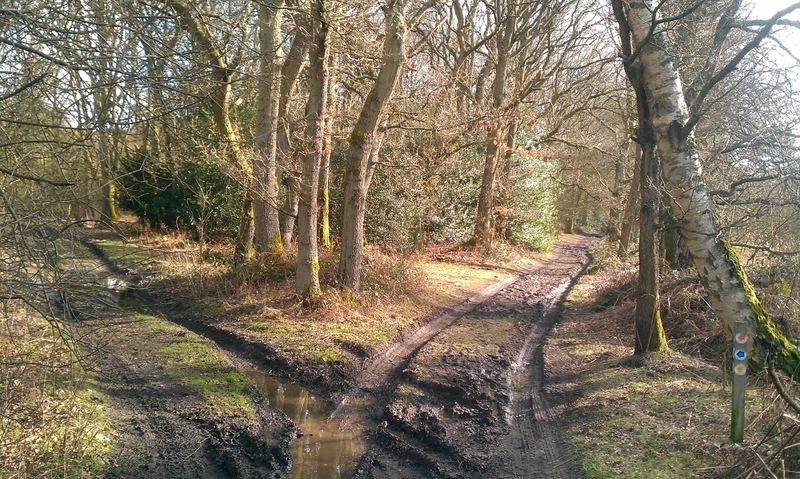 This is technically an unnamed byway so we christened it Quarry Lane, y'know, for the kicks. But according to Hampshire County Council this is Byway 44.